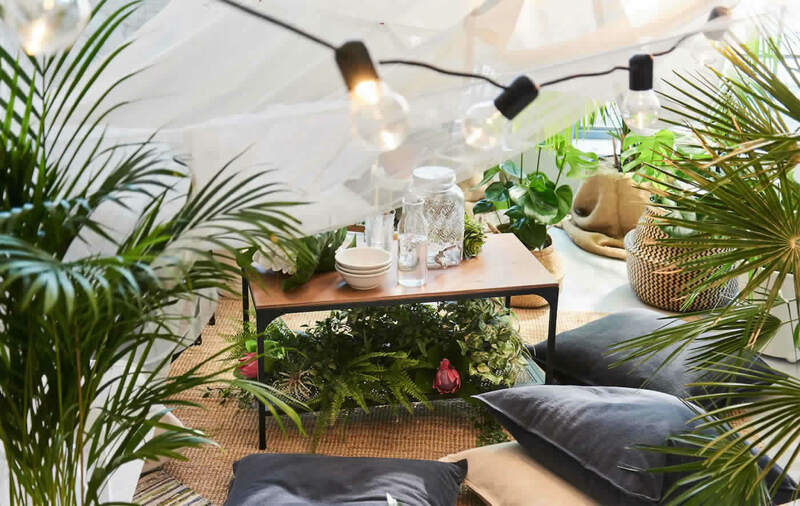 Bring the outside in and create a relaxed nature-inspired setting to celebrate summer in the city, whatever the weather. 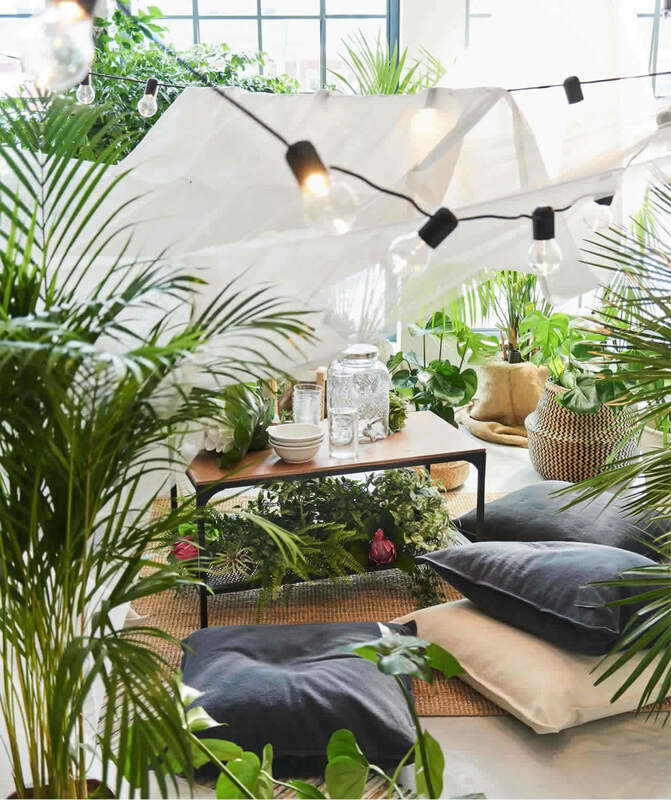 Bring nature indoors with a forest of potted plants – the bigger the better. If you don’t have green fingers artificial trees work fine too. This will give a wow effect and be the first thing guests see. Maximize the outdoor feeling further with atmospheric lights and a protective “roof” to mark the dining spot. We went for LED lighting chains that don’t get hot and draped sheer curtains across them for a pretty contrast. 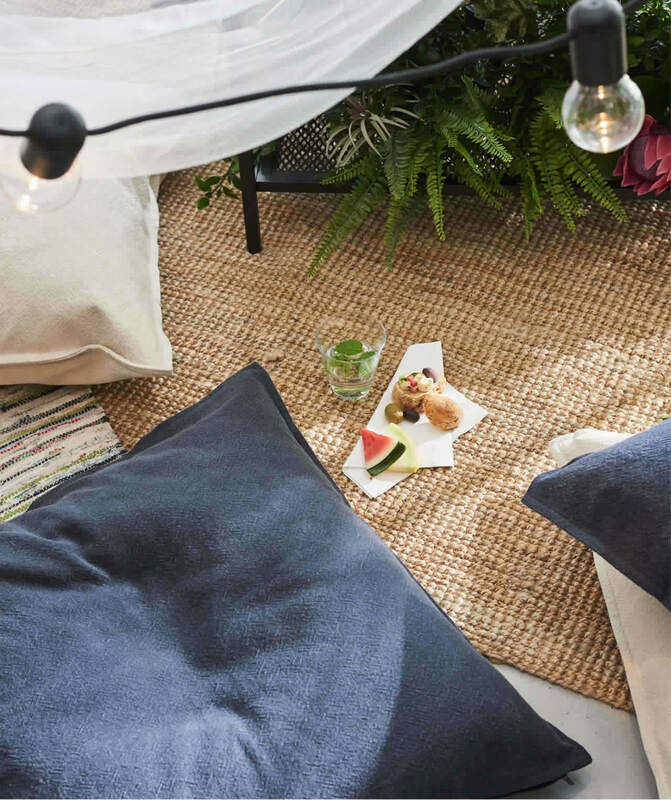 Leave the traditional table and chairs behind and put out a big rug scattered with cushions, so everyone can sit or even lie comfortably. Lay a simple buffet on an ordinary coffee table. Let your visitors serve themselves and eat from plates balanced on their knees. Make a relaxed centerpiece by filling the coffee table’s lower shelf with artificial plants and a flower or two to inject some color. Napkins help the picnic to feel a bit more luxurious and can even become part of the deco. Here we decorated the top of the table with ordinary paper napkins that we rolled up and placed inside a few large leaves used as a holder – pretty and practical!